I think that if the U.K. were to go ahead with this, the government might really want to spell out what such a vote would really be about. So that nobody thinks "Oh, if I vote 'no' that means there will be no Brexit and I can wake up in 2016". Perhaps whatever deal the U.K. can weasel will be a sad one. I wouldn't be shocked. But if it were actually kind of a good one, but the electorate voted "stuff that" because at some level they thought they were voting on a Brexit do-over, that would just add tragedy to stupidity. If part of the need for this "Final Say" is the belief that people were not handed all the right information the first time, surely that can't be fixed by not handing them all the right information the second time. And if the EU gives them a good one, that tells every country having a problem with some detail of the EU arrangements that all they need to do is vote to leave, wait to be offered a deal, then vote not to leave after all. The EU knows this. The UK, while important, isn't so uniquely important they'll be able to set that kind of precedent. At this point, they'd be lucky to be allowed back in with their current opt-outs with regards to currency and border control. ..like people don't understand that the uk is out of the eu now. a statement made based on nothing. ..brexit as originally presented is finished. as stated above the brexit coalition has broken apart. so what is on the table is may's brexit position. it will not be supported in parliament also stated above. the movements have been working on ways to come out of this as unified as possible. unified and under a labour government since may will have to call an election. this is the way forward. this is the way to approach europe. it's the best of bad choices being offered up since the right began this brexit process. "In 2017 we urged readers to Dump The Guardian over its relentless attacks on Jeremy Corbyn. After a short pause, the paper continued and intensified its attacks, this time spreading spurious and damaging claims of anti-Semitism..."
Labour’s ruling body agreed to park some of the most controversial proposals for party reform at a marathon 10-hour meeting on Tuesday, which saw Jeremy Corbyn defeated in a series of close votes. The national executive committee (NEC) set aside for a year plans for Labour councillors to be forced to defer to new “local government committees” before publishing their own manifesto, and for council leaders to be directly elected by Labour members. One NEC member said the meeting had generally been good-tempered, but estimated that Corbyn himself had been outvoted on more than half of the complex series of proposed rule changes. Corbyn’s political secretary, Katy Clark, has spent months carrying out a review of party democracy as the next stage in his project to transform Labour into a grassroots-led movement. As a longtime supporter of the Campaign for Labour Party Democracy lobbying group, the Labour leader advocates greater involvement by members in policymaking. But his critics fear that approach would undermine the role of Labour’s MPs and shadow ministers in developing policy, and weaken their accountability to the electorate as opposed to Labour’s membership. Momentum claimed the latest plan “makes it harder for a socialist candidate to get on the ballot in the future and completely misjudges the mood of the membership”. The campaign group urged its members to lobby the NEC in advance of the meeting. It claimed hundreds of emails were sent in the half an hour before the meeting started, which it believed had helped to sway the mood towards delaying a decision, and perhaps to allow fresh proposals to be tabled. One source close to NEC said the democracy review “is going to look very thin at this rate, with many measures just either rejected out of hand or watered down by the NEC”. They added it was “especially embarrassing that local government reform has yet again been kicked into the long grass”. In the face of the NEC's bureaucratic elitism - and the nightmare legacy of Stalinism - the democratic and humanist left needs to be more assertive. The decision by a left-dominated NEC to create a new PLP and trade union veto over candidates in future leadership elections, combined with their rejection of the right of local parties to select parliamentary candidates in open primaries, combined with bureaucratic machinations to avoid a conference vote on a second Brexit referendum, all speak to the survival of “machine politics” even inside a left-led Labour party. And all students of the 20th century know where the impetus towards bureaucratic elitism backed by left phraseology comes from: the nightmare legacy of Stalinism and its destructive reach into western Labour movements, where it strangled workers’ democracy and attempted to impose thought control. "Don't believe the poll that says 85% of Labour members support a 2nd ref. The answer from their 1000 sample depends on the wording of the question. 2nd ref. takes power from Corbyn. We need an election and victory will give Corbyn a free hand. A 2nd ref. takes power from him." "Defeat for Open Selection and victory for Blair. Second Brexit referendum spells disaster for UK Labour." Last December, the Institute for Public Policy Research presented Labour with a white paper advocating Swiss-style “alignment” with the single market, rather than participation. As with May’s Chequers plan, the IPPR wanted Britain to align voluntarily with some single market rules, but diverge from others in order to promote growth and social justice. Though the shadow cabinet refused to endorse the IPPR plan, the document is the closest Labour has ever come to drawing up its own version of Chequers. But the Salzburg summit showed that a voluntary alignment option is no longer possible. May has wasted two years, and expended almost all the UK’s negotiating capital, only to get her version of it rejected. Labour’s new conference motion, committing the party to participation in the single market, appears to recognise that. Corbyn’s strategy to date – of spelling out red lines and opposing solutions that crossed them – was always designed to allow Brexit-supporting Labour voters to learn by experience how treacherous the process would be. The Tories had told them that leaving would be easy; it wasn’t. They told them the new treaties would be done and dusted by March 2019. They will not be. They assured voters there would be no downsides to a no-deal solution. Now they urge voters to stockpile food in case it happens. The gameplan worked up to a point. May’s chaotic negotiating stance has eroded popular support for Brexit, though not decisively. But the process of learning by experience now has to be supplemented with a positive vision, reinforced by Corbyn and Keir Starmer spelling out a clear Brexit proposal of their own. My position on Brexit has always been a compromise between principle and what’s needed to assemble a voting coalition to put a leftwing Labour government in power. If it had been possible to achieve a leftwing Brexit, I would have supported it: the Lisbon treaty is a machine for destroying jobs and growth, and is stoking disillusion in democracy. But the real-world forces pushing for Brexit in 2016 were always those of xenophobic nationalism, and their project was an even more deregulated and polluted Britain. So I campaigned on remain and reform. I refused to back calls for a second referendum so long as May was engaged in meaningful negotiations to enact what both the referendum and parliament had voted for. But after Chequers collapsed, and the Tories had to rely on Labour Brexiteers to defeat the customs union proposal, it became obvious that there could be no majority in this parliament for any of the government’s desired Brexit outcomes. The best option is a general election – the sooner the better. In that election, for Labour, the promise of a second referendum could be a powerful weapon – especially if it was combined with a clear outline of a Norway-style deal. The shock of Salzburg is likely to push the Tories towards a hard, Canada-style free trade agreement. In that case, the way is open for Labour to make a new, broad offer to British civil society and business. A Norway-style deal, and a second referendum to ratify it and confer democratic legitimacy, could create an electoral coalition ranging from fervent remainers to Brexit voters who just “want it over with”, and would resonate strongly with businesses desperate to remain close to Europe. Labour conference delegates overwhelmingly backed the party’s Brexit policy on Tuesday after Keir Starmer sparked a burst of sustained applause for dropping into his conference speech the line that “nobody is ruling out remain as an option”. 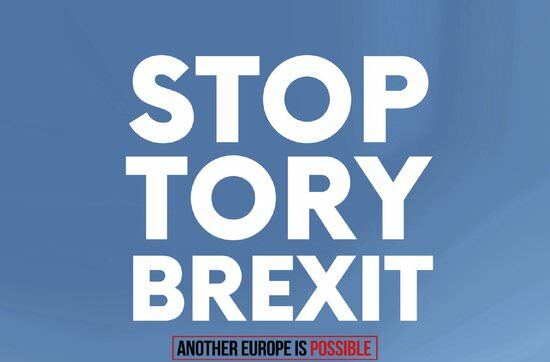 In a compromise brokered by Starmer and backed by the vast majority of delegates in a show of hands on Tuesday, Labour’s formal position is now that the party will seek a public vote on Brexit if parliament rejects Theresa May’s deal and it cannot force a general election. Opening the debate on the issue on Tuesday, the shadow Brexit secretary ad libbed the line, which he had already used in a series of interviews, that “nobody is ruling out remain as an option”. Delegates in the conference hall responded with noisy applause, with some jumping to their feet. Compare and contrast with the reactionary and embarrassing pro-Zionist, NDP and its suppression of BDS at its Convention. ..check out this new labour party video. We have a plan to rebuild Britain. Rebuilding industry. Rebuilding opportunity for workers. Rebuilding our communities. Rebuilding our economy. Rebuilding our public services. Rebuilding for people, not for profit. Rebuilding for families, not for investors. ..this piece is from the new statesman that allows 4 articles. if you've hit the wall try opening in private window mode. The first and most obvious strength is the programme. Labour's June 2017 manifesto has become embedded in the thoughts and practices, not just of a few tens of pro-Corbyn MPs, but a large number of people who matter in a social democratic party: trade union leaders, councillors, allied think-tanks and supportive alternative media groups. The policy announcements this week were focused and incremental: redistribution via share ownership, revival of the high street via microeconomic regulation, more secure tenancies for private renters and a big offer on green jobs. Labour’s programme is “shovel-ready” and there is a resilient network of people inside the party who know how to execute it. The second strength is the membership, currently numbering 540,000, around two thirds of whom were not members when Corbyn became leader. As a public figure, I cannot move in Liverpool without being asked for selfies: but what interests me is the changing social character of the people asking. They are often young, working class men and women - from Huddersfield or Frome or Wigan - who have made the trek to Liverpool under their own steam, just to be here as ordinary party members. There has not been a party of the left with this specific gravity inside civil society since the 1930s. The third strength is that Labour has an answer to Brexit - albeit one that took five hours of horse-trading to achieve. Unfortunately, the weaknesses are many. The most important one is that Labour’s mass membership are not active. They are not a social movement, nor are they greater than the sum of their parts as an electoral machine. Many people complain that CLP meetings, now heavily policed for discipline, and with the right conducting a vigorous rearguard action, are unbearable. The party structure is not conducive to activism and needs to change. Where this will tell is if Labour comes to power as a beleaguered left-wing government, surrounded by enemies within civil society. If it can’t mobilise its supporters to enable the execution of radical policies on the ground then, as with Syriza in Greece, the institutional obstacles, combined with a strategy of tensions stoked by the right-wing press, might overwhelm a Corbyn government. The second weakness is technocratic. Most shadow ministerial teams consist of an experienced politician, two people with PhDs, a press officer and an admin worker. Because Corbyn has eschewed the secondment of corporate expertise into the shadow teams, very few people have any experience of power, and almost none have experience of working inside the power networks of the establishment. A third weakness is the prevalence of Fabianism as an ideology: top-down technocratic socialism courses through the veins, even of people who were anarchists five years ago, because it is in the DNA of the British left. The traditions of syndicalism, direct action and rank-and-file control that flourished in the 1970s are atrophied. Combined with the dogged survival of Stalinism on Labour's fringes, it means the slogan of the US left - the movement versus the machine - will have to be applied within Labour for the foreseeable future. On Monday night Jacobin hosted a rally at The World Transformed conference in Liverpool, addressed by France Insoumise’s Jean-Luc Mélenchon. The event took place alongside the Labour Party conference, at which the French radical-left leader also met with Jeremy Corbyn. In an enthusiastically received speech, Mélenchon called for new forms of mobilization able to confront the challenges of environmental disaster, war, and the neoliberal destruction of democracy. Here we present a lightly abridged translation of his talk. The first is obviously the possible destruction of the only ecosystem that makes human life possible. If we acknowledge that this is a real threat, then we must admit that there is a general human interest. And if this common interest exists, it must be placed above all other interests that may compromise it. This common interest is profoundly anticapitalist. For capitalism is based on the dynamics of endless predation without repair. It is based on a short-termism which is incompatible with the cycles of nature itself. From this observation we deduce two structural demands. The first of these is “the green rule“: do not take from nature more than what nature can replenish. We must, with all our strength, delay the date at which we will be in ecological debt to our planet. The second element I would like to present is the form of political organization which corresponds to “the peoples’ era.” We put in place such a form of organization during my presidential campaign in France. And since then it has become what I think we can call by far the largest activist organization in France. We have 420,000 people registered on our online platform and 54,000 active members in 5,000 action groups connected by this platform. Everyone is free to decide the nature and the extent of their commitment to the movement and can change that at any time. We are not a classical political party that leads society, but rather a movement that is itself part of the life of society and totally porous to engagement with society. The movement is to the people what the party once was to a social class. But it is neither a vanguard or a leadership. Rather, it sheds light on possible paths open to the people and is a detonator that helps people take action on the ground. The movement exists for this objective, and this alone. Our movement, France Insoumise (often translated as France Unbowed — insoumise literally means “unsubmissive”) is an object in constant evolution. It is a common banner and includes party activists who want to participate, the only condition being that they abide by the movement’s own rules. But the vast majority of participants have no party membership. The movement is inclusive. There are no internal power struggles. Often, we choose decision-makers by lot, by random selection. When did it become solely "Tory" Brexit? How would stopping half of Brexit help? ..that poster refers to the brexit the tories are negotiating/navigating. Presumably, the other options are Labour Brexit and "Hard" (no deal) Brexit? Agree with most of that-my only point of dissension from its analysis is about where Stalinism survives in the party. I'd say it survives in far more than the fringes-in most of the Labour Right, from what I've seen, Stalinism is a major part of the mindset...if anything, the Blairite/Blue Labour approach is somewhere close to the Chinese "Market Stalinist" perspective, minus the executions for corruption-the Blairites and Blue Labour, based on the number of their MPs implicated in the "expenses scandal" see corruption as no big deal. OK. But it seems like there's lots of loosey-goosey talk about "another vote on Brexit" that doesn't make it clear whether the vote is to accept/reject the terms on the table, or try to convince the EU to pretend that the UK hasn't already left. As I've noted about fifty times, the UK has already left. They're not "negotiating" whether or not they've "Brexited", they're negotiating the new terms between themselves and the EU. This is like a divorced parent telling the kids "Well, you know that Mommy and I divorced almost two years ago, but if you're unhappy, let's vote on it and if you vote 'stay married' then Mommy has to remarry me!" ..going past what your reading about negotiations, in or out. what may will bring to the table at the end of it will be rejected by parliament. right now the important thing is the process that will bring in the labour gov. already were starting to talk about dealing with the eu. this needs to unfold more. with greece syriza did not turn to the population for support even after it's referendum that rejected the eu position. labour will not make that mistake. "A Twitter storm is about to hold the Guardian to account for its coverage of Jeremy Corbyn." "George Galloway suggests Labour have come out of their conference without a conclusive Brexit strategy..."
..i listened to galloway. he's correct that there is more than one point of view on brexit within labour. eta: my mistake labour did vote for a new brexit vote. ..how labour will proceed on brexit still needs to be worked out. they still have a bit of time but it's getting shorter fast. i'm ok with that for now. it will be important to be able to sell that position to a divided public because an election will be following close on the heels of the tory brexit offerings. Of course, it will not be easy devising new forms of participatory public ownership capable of drawing not only on workers’ knowhow in any given industry, but on the knowledge of users, customers and surrounding communities as well. But Labour is now throwing open the doors to those who would like to put forward their own ideas about public ownership that is very much not in the old style. Instead it involves a redefinition of what “the public” means. Trade unions, local authorities and social movements of different kinds are being invited to lend their creative intelligence to this end. The Preston model is just one example of this. The failures of privatisation and the intensity of social need, together with issues such as the urgency of climate change, have led a new generation to devise new strategies and find allies: not only to protest, but to collaborate on real alternatives that can exist here and now. Trade unions are generally weaker than in the past, so local groups of Momentum (which help organise supporters of Corbyn’s project) and Labour branches can go some way to filling the gap by developing practical alternatives at local level. The co-operative movement, for example, is undergoing a new lease of life as private enterprise fails to meet social and environmental needs. Unemployed people – especially young people – increasingly see collaboration as the only way to ethically make a living. They are finding that the same technologies that have been used by big tech firms to fragment work can be redesigned as tools of social collaboration. These experiments, born of necessity, can be the basis of a transformative force that could both help Labour to win the next election and form the basis of a new democratic economic order when Labour takes office. This recognition of workers as not simply an interest to be defended but as knowledgeable, creative allies in the process of production of social wealth, considerably strengthens Labour’s claim to be the party with which voters can best entrust the economy. It enables today’s Labour Party to break from the implicit pact that private enterprise should be allowed to run production, while the state looks after redistribution – the one supposedly efficient, the other supposedly fair. This foundation stone of the post-war consensus effectively left Labour one-handed and vulnerable to attack as the party of spending, rather than creating wealth. "In, out, in out? Does anyone know if Labour wants the UK in or out of the EU? By even suggesting that the British public might be asked again if they want to stay in the EU, just two years after they voted to leave, Labour have allowed the Tories to present themselves as the only party who will stand up for Brexit..."
The SNP would demand Labour scrap Britain’s nuclear weapons programme in any election pact that puts Jeremy Corbyn in Number 10, the party’s defence spokesman has said. Nicola Sturgeon’s party dominates politics north of the border, holding 35 of 59 seats, and unless Corbyn secures a major landslide victory when voters next go to the polls, it is likely he will need to broker a deal to clinch power. But Stewart McDonald said the SNP would not set aside its opposition to weapons of mass destruction and that the issue could be a “red line” for the First Minister of Scotland. Britain’s opposition Labour Party said the ruling Conservatives must spend a total of 108 billion pounds ($139 billion) on public services in next week’s budget to reverse the impact of a decade of austerity. Prime Minister Theresa May’s promise to end austerity would require widespread spending across government departments, welfare, education and local government, rather than “financial conjuring tricks,” the party’s finance spokesman, John McDonnell, will say in a speech Thursday, according to remarks emailed by Labour. Europe never wanted Brexit and would be grateful to avoid it now. Politically if offered they have to accept a chance to undo Brexit. Like everything else, the reason is money. Those in favour of Europe understand that Britain leaving improves the cahnces of total disintegration. The reason is clear. The cost of Europe is not cheap and the remaining countries politically are terrified about the increased bill remaining countries face at each exit. The Germans were debating this just in the last week. So if the one that was leaving changed its mind the ones that are facing the cost of maintaining Europe have to either allow this or accept a greater bill on their governments to continue Europe or give up on Europe. You can see of course that Europe supporters would find it easier to forgive the UK for its mistake and let them stay than to ask their governments for more money for Europe's government and take the risk that more will pull out. Enter the dynamic with Italy and yes, Mommy does have to remarry. She would be very happy to. Europe's hard line on the UK is not becuase they do not like the UK in Europe but becuase they do not want to reward a country for pulling out. A little silly to suggest that Europe would take much longer than a New York minute to say "welcome back, please don't run away from home again, -- phew." Mommy does have to remarry. She would be very happy to. If she's happy to, then it makes little sense to say she also has to. Maybe you're right. Maybe the EU would jump at the chance to pretend all of this never happened. Personally, I doubt it though. And there's only about five months left for one side or the other to put their tail between their legs and ask. George Osborne is quoting Marx. Francis Fukuyama, who triggered free market euphoria in the 1990s, thinks we need the return of socialism. And the Conservative government is trying to “out-Corbyn Corbyn” by declaring austerity over – even if it struggles to deliver the price of an extra minibus to our cash-strapped schools. Something has changed in the mindset of people who were once convinced that the market would solve all humanity’s problems, and it’s not hard to see why. Liberalism and the centre-right are surrounded by a rising tide of far-right ideology that they cannot deal with. For the last 10 years, we’ve seen wages stagnate and growth underperform. Before that, even in the good times, we had revelled in the atomisation of traditional communities, assuming the social problems caused by de-industrialisation would go away. Now we have to live with run-down high streets, police forces struggling to contain crime, pervasive insecurity and a sense that, though things might not get any worse, they won’t get substantially better. To rescue the situation we need politics probably even more radical than the ones Corbyn offered in June 2017. We need to tax more and spend the proceeds on rebuilding Britain. But John McDonnell’s team know that the £49 billion they wanted to raise in taxes on companies, rich individuals and property speculators is about the limit; most of it would go on reviving schools, councils and the NHS and making university tuition-free. That’s why the most important Labour policy is to borrow £250bn and spend it on reviving our national infrastructure. In addition to taxing, borrowing and spending I would – unlike McDonnell – use the Bank of England’s formidable money printing power to kickstart a modernisation, research and innovation drive across British industry. Leo Panitch, who was in Liverpool to observe developments at the Labour Party conference and to speak and participate in Momentum’s “The World Transformed” festival there, assesses the opportunities and challenges faced by Corbyn and his social movement supporters in pursuing the project to democratize the UK Labour Party – and transform British politics. Moreover, what are the implications for an international left largely in retreat? "Corbyn does not want to be part of a political elite conspiring to thwart the results of a democratic referendum and rightly so. It takes courage to withstand the whims of the liberal commentariat." Nor to lead a country in which significant decisions are made by neoliberal bureaucrats in Brussels. The shadow foreign secretary, Emily Thornberry, has attempted to calm Labour dismay at Jeremy Corbyn’s announcement that “we can’t stop Brexit”, by insisting the option of campaigning for a second referendum was still on the table. Thornberry told BBC One’s The Andrew Marr Show: “Theresa May is simply giving us a devil in the deep blue sea – she’s saying you can either fall off a cliff or get on this bridge to nowhere, and you’re going to have to vote on that. “That’s not a meaningful vote. That’s not an injection of democracy. We say if you’re going to give us that, we refuse to play that sort of game and, frankly, if you can’t come up with a decent suggestion then we should have a general election. Would that be a matter of confidence in the government? Could blocking "no deal Brexit" force an early election? ..don't know. maybe someone else does. Since a Brexit deal has to be negotiated and signed before April, is there even enough time to hold an election in the meantime? ..i believe deal or no deal the majority of brits will be better off under a labour gov with their current platform. "...Ms Thornberry sought to calm Labour tensions by saying the party could still back a Final Say Brexit referendum, just a day after her leader rubbished the idea. The shadow foreign secretary said 'all options remain on the table' if Labour fails to force a general election by voting against the deal, if there is one. Mr Corbyn has angered Labour MPs and supporters by arguing Brexit cannot be stopped - and by going on to reject the growing calls for a fresh public vote. But Ms Thornberry said: 'If we don't have a general election, then yes, of course all the options remain on the table, and we would campaign for there to be a people's vote - but there are several stages before we get that." "Politicians from all sides of the Brexit divide doubting May can get a deal through Parliament. Brace yourself for a general election and we'll be ready." "MPs Will Block May's Brexit Plan..."
The last election took 50 days. There's plenty of time. In an age of transnational corporations and global finance-driven speculation, socialist strategy is doomed if it focuses exclusively, or even primarily, on any individual nation state. Yet, at the same time, popular struggles for control over nation states are an essential part of a necessarily international strategy. This is my starting point in responding to Costas Lapavitsas (page 38) and his call for socialism to ‘start at home’. Theresa May summoned her cabinet to an emergency meeting on Wednesday afternoon to sign off her long awaited final Brexit deal, prompting hard-Brexit Tories to call for senior ministers to stand up and block it. The critical meeting is the culmination of months of negotiations and will see May’s senior ministers consider whether they can personally endorse the agreement that the prime minister has been able to reach. Ministers were summoned to No 10 in the early evening and some met individually with May or her chief of staff, Gavin Barwell. They were given the chance to read the key documents, although they were not trusted to take any papers home. Further one-on-one meetings were expected to take place on Wednesday. Labour’s motion forcing the government to publish its legal advice on Brexit has passed without a division. The motion, put down by Keir Starmer, uses the humble address procedural device that Labour used last year to force the government’s hand on the impact assessments. Tory MPs were told by whips to abstain on the vote, which led to the motion being passed without a division. It has become common for May’s government to abstain on Opposition Day debate votes that they might lose, as they are non-binding, but a humble address is different.